We carry Aluminum Flatbed Trailers in a lowboy configuration with tilting and non-tilting options. With their extruded aluminum frame and flooring, they tow easily behind any vehicle, do not rust or corrode, and will outlast a steel trailer with no problem. 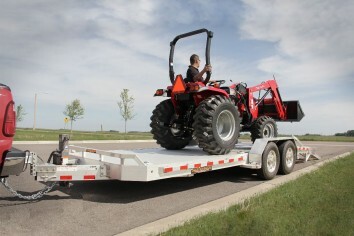 Light and versatile is the key with these trailers. We carry the most complete aluminum flat deck utility and recreational line around. We offer utility trailers, ATV trailers, flat deck snowmobile trailers, open motorcycle trailers, personal watercraft trailers, car haulers and truck beds with headache racks. 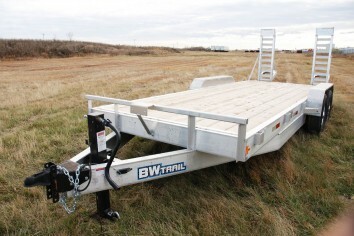 These trailers offer longer warranties and are lighter, as strong as, and more durable than steel. Aluminum is estimated to be 12.5% stronger than steel. Due to the lightweight of these trailers, you are able to load more weight (additional payload) onto them over their steel counterparts, not to mention the increased gas mileage when compared to pulling a steel trailer. The ramps on these trailers are much lighter and easier to handle then those made of steel. 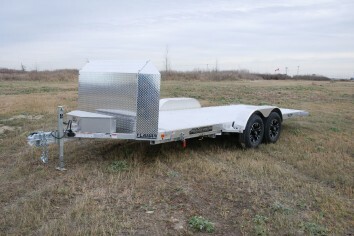 These types of trailers come with aluminum rims that add to the sharp appeal these trailers give off. These trailers make the perfect sidekick for camping or any outdoor activity, you are able to unhook and move these trailers aside by hand to utilize the most of the space you have available. 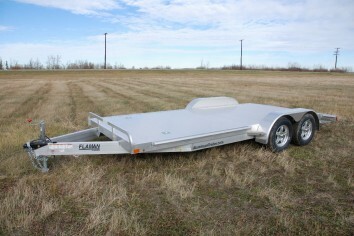 Our utility line of aluminum trailers come up with option of having removable sides and slide in or flip up ramps. If you are looking for a trailer that will withstand the test of time and look as sharp as the day you bought it, then an aluminum trailer is the one for you.